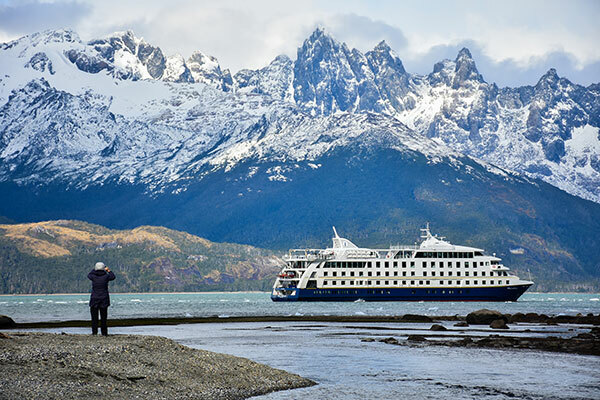 Australis Cruise Lines is offering 25% off on bookings on its cruises that navigate the Beagle Channel, Cape Horn and the remote islands of Tierra del Fuego. Savings on a four-night, one-way cruise are US$739 per person, on the all-included expedition cruise experience. This offer is good on bookings made on the new Ventus Australis and the Stella Australis when a deposit is received before Feb. 17 for the March 1 and 5 departures from Punta Arenas, Chile and the March 13 departure from Ushuaia, Argentina. Australis ships are the only ones permitted to sail in the narrow fjords and past spectacular glaciers in one of the last remote areas on the planet at the bottom of the world. The custom-built ships enable guests to see up-close exotic wildlife such as the Magellan penguins and elephant seals, and a lush sub-polar forest and gigantic glaciers calving. The cruises are four nights one way or round trip in eight nights. Weather permitting, guests aboard Australis disembark at legendary Cape Horn, where the Atlantic and Pacific Oceans meet. It is the last land before Antarctica, 500 miles away. The ships offer 100 cabins each and can accommodate 210 persons. All-included rates start at US$1,440 per person for the four-night cruise. All meals, open bar, lectures and shore expeditions are included. The ships are safe and comfortable with large picture windows for panoramic views of the landscape. Australis hosts internationally renowned chefs to consult on the cuisine and the wines are among Chile’s best. For additional information and reservations, contact Australis at 1-800-743-0173 or e-mail northamerica@australis.com.